Providing a forum for networking among members, presentations, and finding out useful information including information required for business management. We operate several divisional groups representing various different industries, in which members can join to exchange information at presentations, visits and other events, deepen their personal networks, and have their views or those of their industry taken up by the Chamber of Commerce and Industry. We run various events such as New Year celebrations, businesswomen's events, inter-industry study groups, and golf tournaments for members, which provide an opportunity to meet other local members and obtain business information or mingle with people from different industries. This college offers a diverse curriculum targeted at managers, staff, and entrepreneurs. The seven available courses provide the information and guidance you need through lessons where you can acquire essential skills for the future and obtain qualifications by learning from business people and specialists. The course titles are: "Course for Company Managers, Next-generation Managers, and ManagementCandidates", "Company Formation, Stage 2 Company Formation, and Business Innovation","Succession Planning and M&A", "Practical Business Know-how", "Human Resource Development", "Overseas Operation Support", and "Practical Bookkeeping". We hold examinations for acquiring certification in a number of fields including "Bookkeeping" and "Retail Sales" that are of direct relevance to business, "Japan Chamber of Commerce and Industry PC Course" that teaches skills for living in a networked society, and "Practical Business Law", "Environment and Society (Eco)", "Color Coordinator", and "Kawasaki Industrial Tourism" that cover modern lifestyle topics. We also offer training to prepare for these certification examinations. These are services that assist with welfare benefits for proprietors and their staff. A range of different schemes are available to suit your needs. 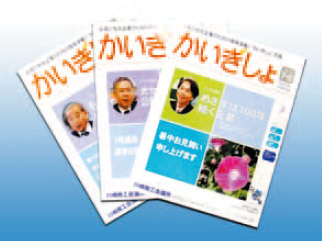 This is the official magazine of the Kawasaki Chamber of Commerce and Industry with content that includes the latest information about local industry, industry news, and useful business data. It is sent to all members. Useful information about presentations, seminars, examinations, and other events. We work with specialist agencies to offer discounted diagnostic testing for lifestyle diseases to assist with managing the health of proprietors and staff of member companies as well as their families. Copyright © The Kawasaki Chamber of Commerce and Industry All Right Reserved.